L-Glutamine is one of the 20 amino acids encoded by the standard genetic code. Its codons are CAA and CAG. Glutamine is a substance naturally produced in the body to help regulate cell growth and function. There may also be man-made versions of these substances. Glutamine is used along with human growth hormone and a specialized diet to treat short bowel syndrome. We believe this to be the best material available anywhere. Completely homogeneous by TLC showing one spot. Prepared in cell culture grade water. L-glutamine is an essential amino acid that is a crucial component of culture media, which serves as a major energy source for cells in culture. Optimal cell performance usually requires supplementation of the medium with L-glutamine prior to use. L-glutamine is an essential amino acid that is a crucial component of culture media, and serves as a major energy source for cells in culture. Optimal cell performance usually requires supplementation of the medium with L-glutamine prior to use. 50 mL amber serum vial with rubber stopper. Prepares a 200 mM solution when reconstituted to 10 mL with sterile water. Qualified for use in cell culture applications, especially serum-free cell culture. The dipeptide L-Ala-LGln is frequently used in modern serum-free media formulations because it provides a more stable form of glutamine in vitro. In culture medium for hypothalamic neurons1; Spacer in isotachophoresis of serum proteins2; Growth requirement of various microorganisms3. This certified reference material (CRM) is produced and certified in accordance with ISO/IEC 17025 and ISO Guide 34. Values of analytes vary lot to lot. Indication Used for nutritional supplementation, also for treating dietary shortage or imbalance. Pharmacology Like other amino acids, glutamine is biochemically important as a constituent of proteins. Glutamine is also crucial in nitrogen metabolism. Ammonia (formed by nitrogen fixation) is assimilated into organic compounds by converting glutamic acid to glutamine. The enzyme which accomplishes this is called glutamine synthetase. 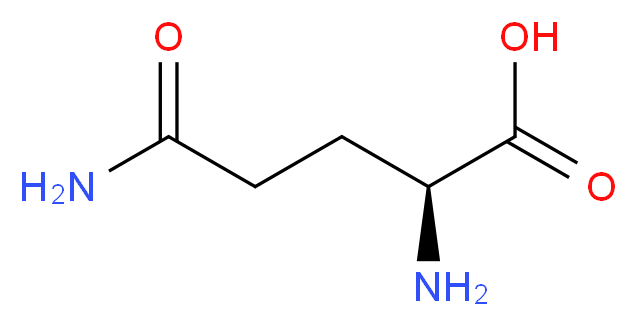 Glutamine can then be used as a nitrogen donor in the biosynthesis of many compounds, including other amino acids, purines, and pyrimidines. Toxicity Doses of L-glutamine up to 21 grams daily appear to be well tolerated. Reported adverse reactions are mainly gastrointestinal and not common. They include constipation and bloating. There is one older report of two hypomanic patients whose manic symptoms were exacerbated following the use of 2 to 4 grams daily of L-glutamine. The symptoms resolved when the L-glutamine was stopped. These patients were not rechallenged, nor are there any other reports of this nature.